This fine instrument, a rounded-top/flat-back design with opening in back for access to electronics, is the result of much research into what would improve the electric violin for the gigging player. Gone are the friction pegs and sharper edges that are seen on a traditional instrument. Friction pegs are a drag! They are also difficult to thread in backstage lighting when you've broken a string. We use high quality Grover tuners and find these are an excellent alternative. One need seldom avail one's self to the built-in fine-tuners on the light/sturdy steel tailpiece when there are Grovers on the headstock! Even with the Grovers, the instruments is in no way "top heavy" and a player worried about weight will be pleasantly surprised. 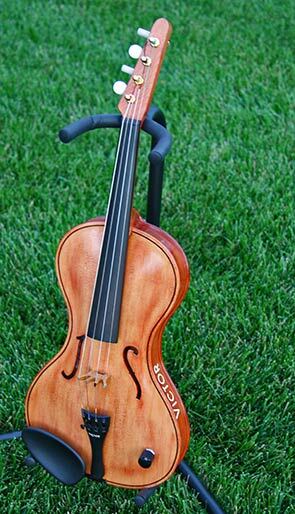 The body shape is modern and appealing, yet still classic, being a little wider at the bottom then a standard violin. We found this enhances tone while creating a good fit into most standard guitar stands. While semi-acoustic in design, the Victor Performer is a 100% electric violin; the specially designed hollow body helps our pickup/bridge systems to capture a uniquely bowed-string tonal character. Good looks and modern updates are great, but at the end of the day, the tone and playability have to be outstanding. A violinist will find the Performer light and comfortable to play (typically with or without a shoulder rest). We employ a standard mensur of 330 mm, which will feel familiar to most players. For amplified tone, we use pickup/bridge systems designed with proven history in mind while adding our own improvements. Pictured on this instrument is our version of the Berkley designed Strados bridge. We have updated materials to improve tone - using Maple instead of plastic - and allowing the bridge to rest on the surface of the instrument, more like both a traditional violin bridge and the original Berkley patent. Additionally, we use an internal, 9v powered mixer to allow individual volume control of each "finger." Thus, the aggregate output can and will remain balanced. Please note, other Victor bridge/pickup models will be available shortly! Find the one that appeals to your own individual sense of tone and artistry. Purchase more than one then easily and quickly change them for particular applications! More on that soon. If you are a working electric violin player or just someone who enjoys playing and seeks a high quality instrument, we think you will find a lot to like in the Victor Performer. A variety of colors and finishes are available as well as pickups/bridges and custom "f" holes. Contact us for more details!